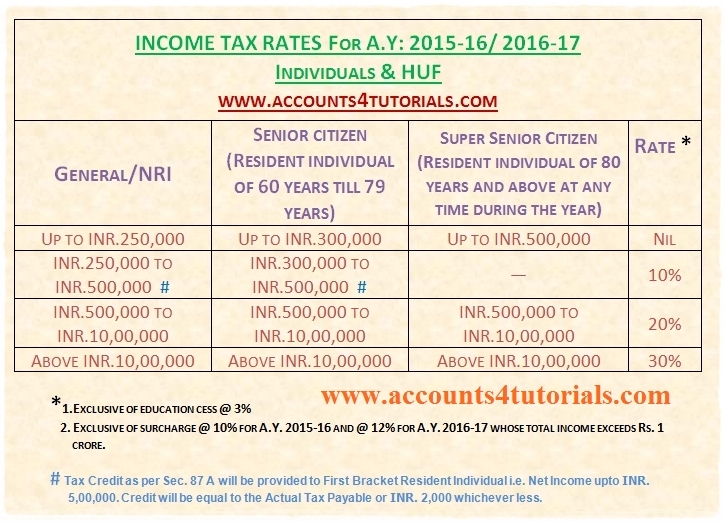 This Article is related to Introduction of Income Tax Returns, Tax Rates, Income Tax Deductions and Type of Incomes. Income tax is charged in assessment year at rates specified by the Finance Act applicable on 1st April of the relevant assessment year. It is charged on the total income of every person for the previous year. Gross Total Income (G.T.I) :- The aggregate income under the 5 heads of income (viz. Salary, House Property, Business or Profession, Capital Gains & Other Sources) is termed as “Gross Total Income”. Employers contribution (taxable) towards recognized provident fund. (i)Salary is chargeable on due basis or receipt basis, whichever is earlier. 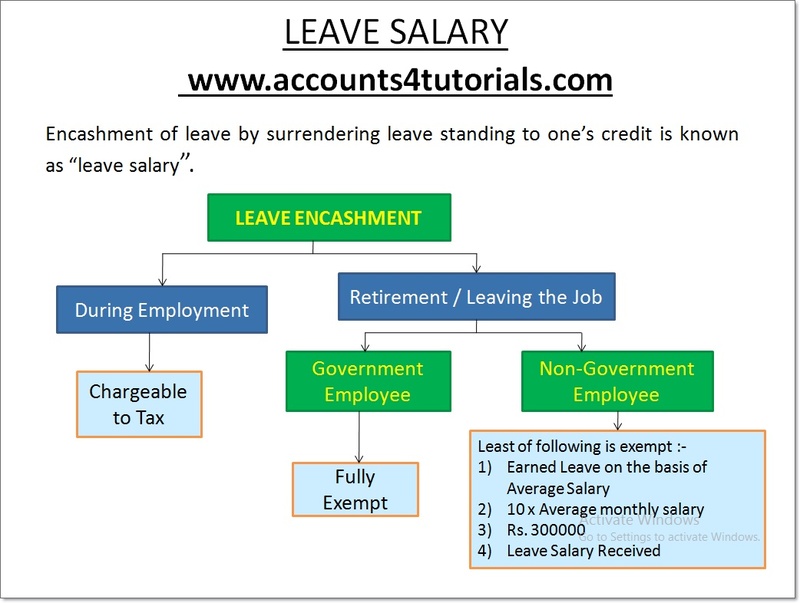 (ii)Advance salary and Arrears of salary are chargeable to tax on receipt basis only. Allowance is generally defined as a fixed quantity of money or other substance given regularly in addition to salary for the purpose of meeting some particular requirement connected with the services rendered by the employee or as compensation for unusual conditions of that service. Dearness Allowance - It is Always Taxable. City Compensatory Allowance - It is Always Taxable. Exemption In Respect Of House Rent allowance is regulated by rule 2A. The least of the three given below is Exempt from Tax. House Rent Allowance Received by The Employee in Respect of The Period during which Rental Accommodation is Occupied by the Employee during the Previous Year. The Excess of Rent Paid over 10 % of Salary. The amount utilized for the specific purpose for which allowance is given. 3. Annuity [Sec. 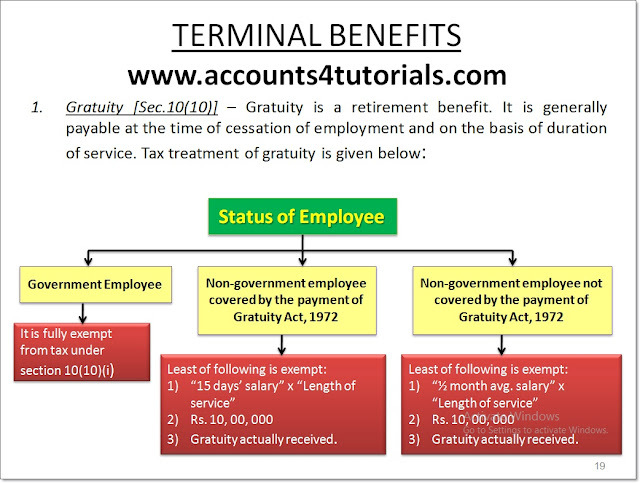 17(1)(ii)] – An annuity payable by a present employer is taxable as salary even if it is paid voluntarily without any contractual obligation of the employer. An annuity received from an ex-employer is taxed as profit in lieu of salary. 5. Compensation received at the time of Voluntary Retirement [sec.10 (10C)] - Compensation received at the time of voluntary retirement is exempt from tax, subject to certain conditions. 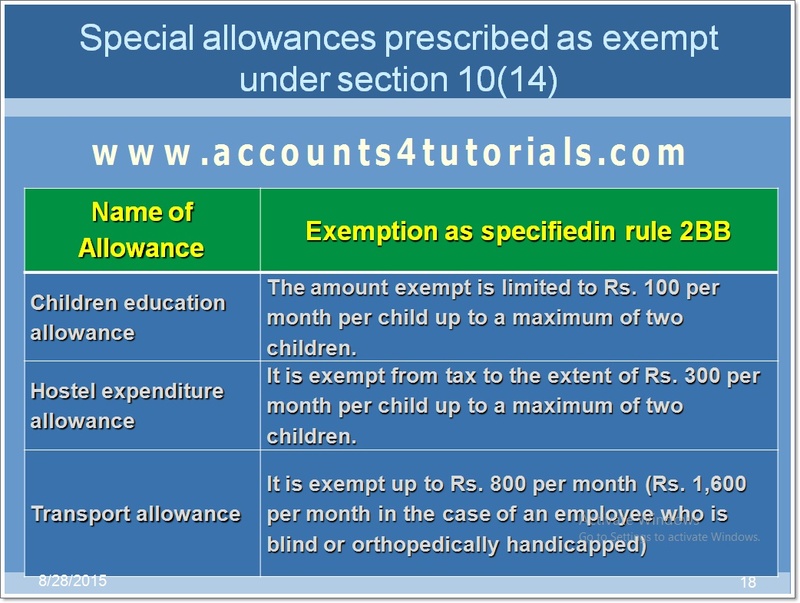 Maximum amount of exemption is Rs. 500000. Provident Fund Scheme is a welfare scheme for the benefit of employees. The employee contributes certain sum to this fund every month and the employer also contributes certain sum to the provident fund in employees A/c. the employers contribution to the extent of 12% is not chargeable to tax. 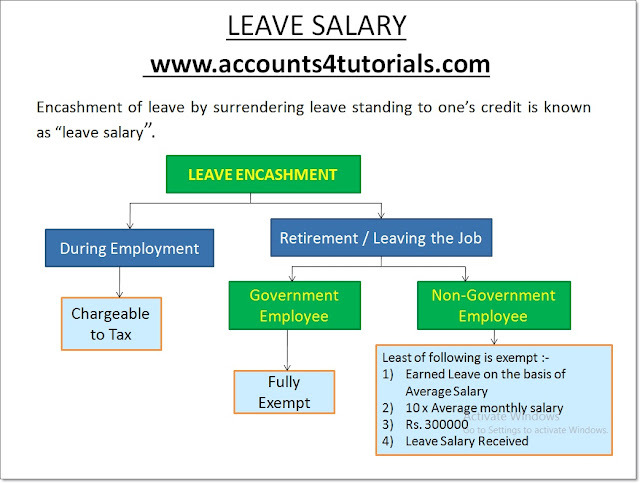 Encashment of leave by surrendering leave standing to one’s credit is known as “leave salary”. Employment Tax / Professional Tax [Sec.16(iii)]: Any sum paid by assessee on account of a tax on employment within the meaning of Article 276(2). Under the said article employment tax cannot exceed Rs. 2500 p.a. When an assessee is in receipt of a sum in the nature of salary, being paid in arrears or in advance, due to which his total income is assessed at a rate higher than that at which it would otherwise have been assessed, Relief is granted on an application made by the assessee to the assessing officer. Read The following Helpful Tutorials for More About Salaries. The basis of charge of income under the head ‘income from house property’ is the Annual Value of the property. Income from house property is charged to tax on Notional Basis, as generally tax is not on receipt of income but on the inherent potential of the house property to generate income. The property must consist of buildings or lands appurtenant to such buildings. The assessee must be the owner of such house property. The property should not be used by the owner thereof for the purpose of any business or profession carried on by him, the profits of which are chargeable to tax. In case of Self-occupied House Property Net Annual Value is always Zero. Since NAV is zero, the municipal taxes paid by the owner of the house are not deductible. ii.Interest payable on capital borrowed for acquisition, construction, repair, renewal or reconstruction of house property :- Actual amount of interest for the year on accrual basis plus 1/5th of the interest, if any, pertaining to the pre-acquisition or pre-construction period. Read the Following HOUSE PROPERTY Articles. Income of every kind, which is not to be excluded from the total income and not chargeable to tax under any other head, shall be chargeable under the head “Income from Other Sources”. The total income of an assessee is to be computed after making deductions permissible u/s 80C to 80U. However, the aggregate amount of deductions cannot exceed the Gross Total Income. Long term Capital Gains referred u/s 112, and Short Term Capital gains referred u/s 111A. Winnings from lotteries, races, etc. as referred to in section 115BB. 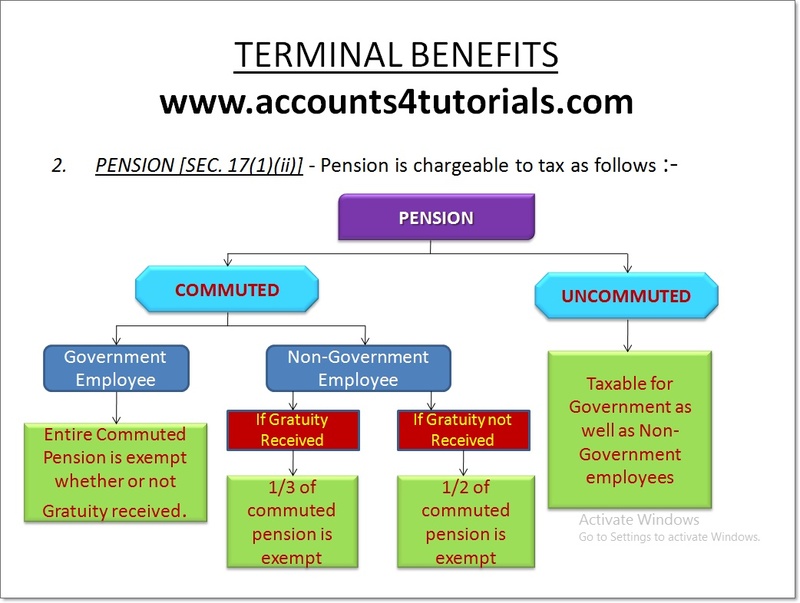 for receiving pension from the fund referred to in section 10(23AAB). Rs.15,000 in other cases for insurance of self, spouse and dependent children. amount paid under scheme LIC / UTI other insurer approved by CBDT for maintenance, of a “dependant”, being a person with disability. Rs. 50,000 (Rs. 1,00,000 in case of dependant suffering with severe disability), irrespective of expenditure incurred or sum paid. dependant mainly on such individual or HUF for his support and maintenance. Rs. 40,000 (Rs. 60,000 in case of a senior citizen). for the higher education of his relative. 100% of the amount of interest on such loan Deduction will be admissible. 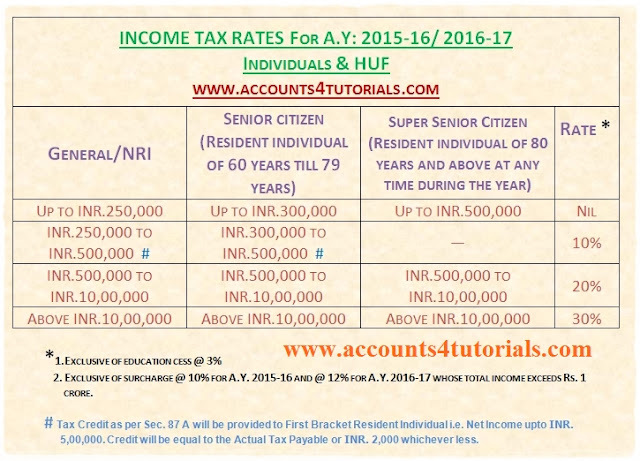 Deductions are eligible for deduction upto either 100% or 50% with or without restriction. There is specified list for each of the four categories. If donation is given in the form of cash for amount over Rs. 10,000 then deduction is not available. Rent actually paid for any furnished or unfurnished residential accommodation occupied by the Individual, who is not in receipt of any House Rent Allowance (HRA). Should not have Self-Occupied property. Rent paid less 10% of adjusted Total Income. Deduction of Rs. 10,000 in respect of Interest on deposits in Savings account is available. Savings account can be with a Bank, co-operative society or post office. 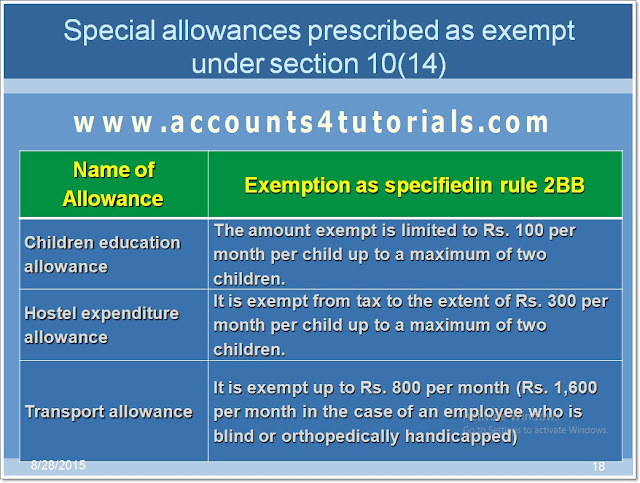 In case of severe disability, Rs.100,000 is allowable. Certificate from Govt. Doctor is necessary. Also Read the Following Income Tax Deduction Articles. Also Read the Following RATED INCOME TAX Articles. Thank u for ur comment.